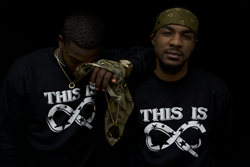 This Is Infinity, also known as Tii215, is a hip-hop and R&B group blowing up out of Philadelphia. The core members, "Always" Blue and "i95" Outlaw, have built their careers on shared friendship, passion, and ambition. Giving back by day and taking over the stage by night, the two pride themselves on putting all the efforts into their careers, while never forgetting where their roots in their community. For all the latest music and news from This Is Infinity, fans can visit their official website. Tickets for upcoming Coast 2 Coast LIVE concerts and showcases are available for purchase through the official website. Will “Always” Blue was raised in North Philly. At a young age he decided he would never fold under pressure. Early on he had made a name for himself as an amateur boxer, but after breaking his hand in a fight he spent his recovery time studying music. His talents flourished and he began drawing attention as innovative producer. Josh “i95” Outlaw is the son of a North Philly hustler and a West Philly Choir girl. After experiencing some turmoil in the city, his family relocated to Georgia. Being an outsider he had to find some way to connect with new people, and music was the perfect tool. He first began writing poetry, which eventually led him to start freestyling rhymes. It became a consistent habit from him to practice in front of his classmates. In 2012, returning home from the Army, Outlaw moved back to Philly where Blue had been living. After years of individual losses and hardships, the two connected to form a brotherly bond. Through music, family connections, and shared experiences they built a foundation on which they could build an authentic brand. In the winter of 2015 Blue and Outlaw decided to go public with their work. With the help of an experienced business partner, This Is Infinity (Tii215) was born.